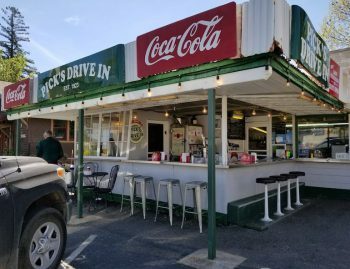 What is so magical about collecting old signs, oil bottles, gasoline bowsers, and old gas station tools and equipment? I’m one of those who is curios about the memorabilia although I don’t collect anything. I grew up in a family business in the central city of Brisbane, Queensland, Australia. We owned a car parking station at 180 Elizabeth Street, Brisbane. It was first known as Polman’s and in the early 1960s became known as Ron O’Neill’s Parking Station. 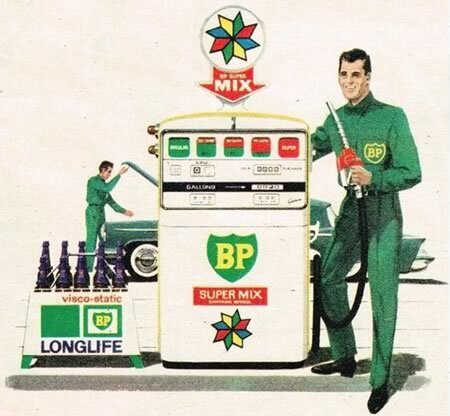 BP Super Mix was a marketing project which offered special gas pumps that could mix Regular and Super grade fuels in various proportions to best suit your car. The concept was confusing and dropped within a year or two. We sold ‘petrol’ as it is known in Australia, or gas (gasoline) in the USA from classic old gas pumps, and oil was dispensed from classic Castrol Oil dispensers into a colorful display of reusable oil bottles with various labels attributed to the type of oil viscosity available. Corporate branding of BP, BP Supermix, Dunlop Tires and other motoring signage decorated the walls and created the atmosphere of a motoring hub. It was interesting, curious, and exciting! 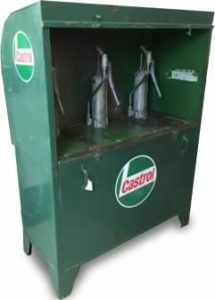 Castrol Oil dispenser from the 1950s and 1960s. The oil crisis that began in the 1970s began to diminish the value of motoring related advertising. It was a new age, and within the next decade, computers were to become household items and designer label clothing and hip new movies replaced the romance with motoring and the oil age. And now these greasy old machines, rusty and faded old signs, glass containers, oil cans, advertising clocks, promotional keychains, and tools are valuable collectors items used to decorate a home garage or motoring venue. I was traveling through Idaho recently and found this old gravity type wheel balancer dating from the 1960s. As you can see, the antique dealer’s price tag reads $129.90 and the going rate for one in this condition is around $300.00 – even though it’s now only a decorator piece. Wheel balancing is more sophisticated these days and the service is usually only offered in specialist tire shops. Wheel balancing would have been offered in most gas stations and smaller service shops a few decades ago. 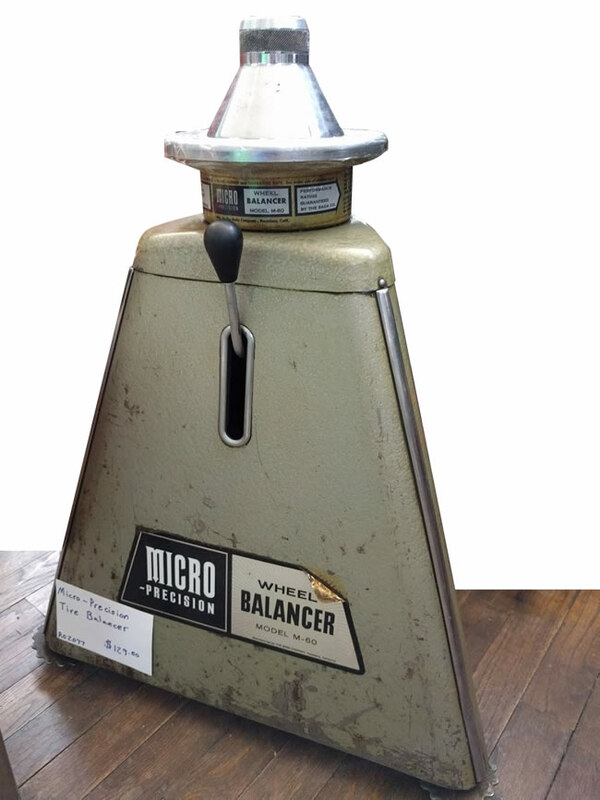 Micro – Precision Wheel Balancer Model M-60 is an obsolete gas station machine and is now a collector’s item. It was located recently in an antique store in central Idaho. Old gasoline bowsers are now collector’s pieces. Many are easy to restore and are great to theme a restaurant, diner, games room, or home garage. Prices vary based on the level of authenticity and condition. Replicas and low level restorations are much cheaper than an original bowser in excellent condition. 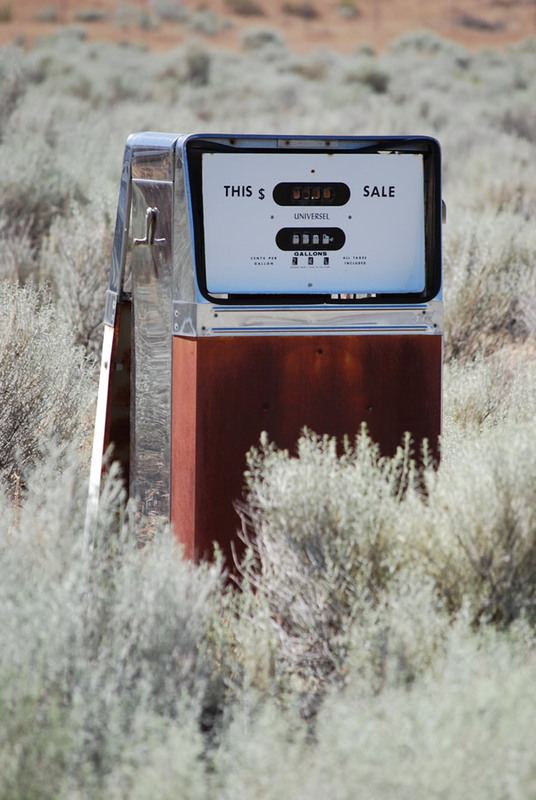 Keep a watch in our blog posts for more old gas station tools and machinery.